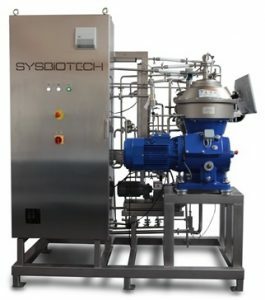 The Sysbiotech System is a crossflow filtration system for Pall cassettes or any other brand. 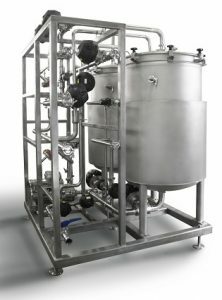 It is used in pilot and small production facilities for batch sizes up to 1000l. 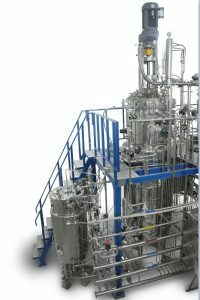 The design and engineering is following cGMP requirements to secure easy startup and qualification of the system. 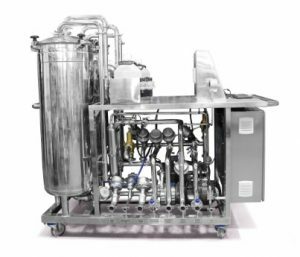 The capacity of the feed pump 10 – 50 L/min. Manual valves are installed for feed, retentate and permeate. Feed flow, retentate flow and permeate flow are measured. Feed pump pressure up to 3barg. One Sysbiotech cabinet (800x800x300 stainless steel) controller for the TFF including industrial PC 17” touch screen and controller with Phoenix or Siemens PLC with Fieldbus I/O boards. All electrical and pneumatic components are wired and tested. C-BioTM software according to GAMPV5 with TFF sequence has example pre-loaded. PLC software according to ISA S88 are preloaded and tested. Power supplies for instrumentation, switchgear, circuit breakers, and overload protection, and frequency inverter for the pump. 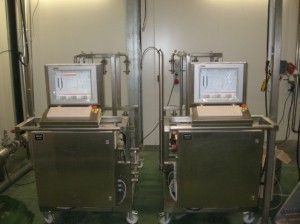 Mass flow x 3: Measurement and recording for feed, retentate and permeate. 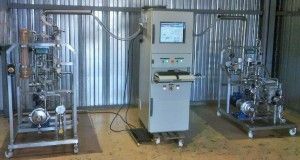 Pump speed measurement control and recording utilizing frequency inverter.